The theme of home and family runs throughout Doris’s autobiography as she discusses her various family homes, her parents, siblings and also the altering of her family dynamics. 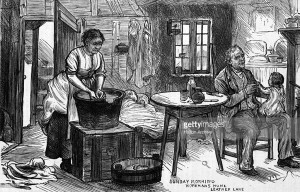 During the past we often saw home life from women’s perspective as they remained in the private sphere while men went off to work and socialise within the public sphere. This seems fitting as we see home life from Doris’s perspective; however, it is also interesting as we see working class home life and her upbringing from her point of view as a child. Swindells claims that it seems that women ‘have been the most interesting as children’ (Swindells, 1994, 137). It is evident that Doris’ family were quite significant in her life as she introduces her family on the first page of her autobiography, informing us that she is ‘the eldest of four sisters’ (Hunt, 14). It is indicated that Doris’s family are from a working class background as throughout her writing she discusses the frequent moving round of her and her family in aid of following her father’s work opportunities. We come to know the intimate details of Doris’s childhood, teenage years and family life as she shares painful stories of loss within her writing. Readers feel connected to Doris whilst reading her writing as it is as if she sharing all her personal stories and trusting us with her emotions. She refers to the loss of her baby sister as a ‘tragedy’, not able to accept the fact that she ‘would never see her again’, ‘dreaming that she was still alive’ (p14). Doris also tells us how she watched her father’s health deteriorate day by day after he fractured his ankle, which she classed as the indirect ‘cause of his death’ at the age of 35 (p14). We see another significant change take place as Doris tells us that her mother accepts the marriage proposal of their lodger. The addition of another father figure to the family is a major change to any childhood or family dynamic. There is not much mention of Doris’s birth father other than in regards to his working life. It is clear that he was determined to provide for his family as he, along with his family, followed wherever work opportunities would take him. His determination is further illustrated as Doris informs us that her father continued to work despite the ‘further detriment to his health’, even travelling ‘until within a fortnight of his death’ (p14). The true extent of their father’s contribution to the family’s welfare was brought to light when their father passed, leaving them with no income due to the ‘pre-Welfare State’ and no insurance. It is evident that Doris’s father’s death changed the dynamic and routine of the whole family. This theory is confirmed by David Vincent as he states that ‘the tenuous balance of the family economy would be threatened by a loss of income if any of the wage earners were affected directly’ (Vincent,1980,235) . Doris’s mother, who ‘had never been allowed to earn her own living’ now became the key breadwinner for the family, going into employment after he husband’s death (p14). She began ‘taking in dressmaking, and giving private lessons in our home’ in order to provide for the family. This would have been highly respected within Edwardian society as ‘home-making’ and as having a stable household was a source of power for women in the 19th and early 20th century (p 14). Doris’s mother going into the world of employment began the domino effect after her father’s death. Doris began to take on more and more responsibilities and as she looks back she saw this as ‘the end of her care –free childhood’, marking ‘the end of another era’ in her life (p14). The end of this era began with Doris looking after her new baby sister for her mother when she returned from school. The responsibilities increased and multiplied as employment was chosen over education, earning money for the family was a higher priority. At the end of Doris’s autobiography we learn that she became engaged and emigrated to Canada in 1924 spending seven years there before they returned to England in 1931. Doris doesn’t elaborate any further on these topics, although she does end this piece of writing informing us that her next piece ‘would have to cover a wider field and involve a larger cast of actors’. This suggests that within the next chapter of her life her and her fiancé may have started a family of their own. Vincent David. Love and death and the nineteenth century working class. Social History, 5.2 (1980): 223-247.